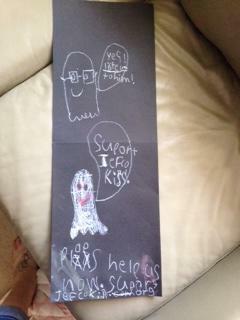 We received this adorable Halloween drawing from a 1st grader via his mom, asking you to Support Jeffco Kids! Also, two other lovely SJK volunteers decided to make some handouts for Halloween to go with the treats. We are sharing these resources in the event that any others want to do so as well. We are touched by the outreach, creativity and support we are receiving from the community! Please remind others to make a donation! Previous PostStop for a moment and answer this one questionNext PostAn Apology in the Form of Donation, Please!